Oh the joys of adolescent acne, with few very lucky exceptions, who among us didn’t suffer with at least a few dreaded teenage pimples? I remember making a much bigger deal out of the occasional zit than it actually was, and I guess that’s what being young is all about. Who knew when you got to be an adult you’d have a whole lot more to worry about. Nonetheless, the makers of Proactiv, arguably one of the most recognized, televised and utilized acne meds of our time has developed an new medication aimed specifically at teens. X Out, which incorporates a nifty high tech idea in order to help teens recognize the recommended two minute wash time for the best acne blasting results. Each bottle of X Out Wash-In Treatment has a QR code can be scanned with a Smartphone that will automatically direct you to the X Out Daily Distraction, which is a new two-minute video that will change everyday. I worry about safety quite often, probably more than I should. Mostly, I worry about my daughter, she’s nine years old and I sometimes wonder if I have made her too aware of dangerous things, or worse, not aware enough. How do you protect yourself and your children? What exactly should she do if a stranger approached her? Yes, we have gone over the scenario plenty of times, but if any of us really were in a bad situation, how can we be sure how we would react? Well, the Personal Screaming Alarm might be able to give you, or someone you love, a voice when they need it the most. The Screaming Alarm looks very much like a small MP3 type device, common electronic or decoration, but in reality, this little powerhouse emits an ear-piercing 130 decibel scream that sounds just like a woman in really big trouble. Check the video after the break. Did you ever wonder why some games come and go, and other games last a lifetime? What is it that takes an old classic like the Frisbee and turns it into a toy that everyone knows, and everyone still plays. Do you ever go to the beach even in this day and age and not see someone with a Frisbee. What makes a toy or a game special like that? Could this be the next Frisbee? Welcome RingStix. Played alone or with friends using 2 curved, (very sword-like) 25 inch sticks and a 5 inch ring. The player, placing a stick in each hand and the ring over both sticks crossed at the center, players simply open their arms wide (and quickly) in order to propel the spinning ring toward the other player. That other player then uses the point of one or both of the sticks to catch the flying ring and sends it back again in the same manner. The faster and harder a player flares the sticks, the farther the ring will fly, sometimes up to 50 yards, even in strong winds. Like father, like son, or so the saying goes. Most young parents would have most probably gone through this particular conversation with their little ones – as to why daddy and/or mummy can carry an iPad and an iPhone, but little Jeremy cannot. The reason is simple – how can a little kid know about good stewardship? Surely there will be mistakes along the way, and replacing a broken iPad is definitely an expensive mistake to make. Not only that, most tablets do come with adult-centric apps (obviously), with very little (or no) attention being paid to apps and programs that appeal to kids. 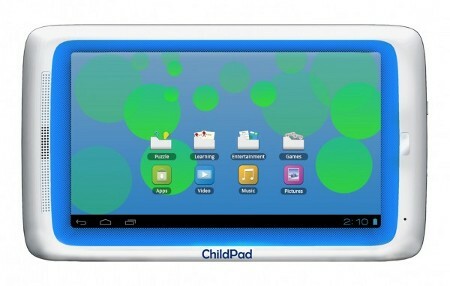 Well, Archos sees this particular niche and has decided to step up the game by announcing the Archos Child Pad. This 7″ tablet will run on the Android 4.0 Ice Cream Sandwich operating system, and is said to deliver a safe, fun, full tablet experience – all for just $129 a pop. Ever since I was little, I always loved the idea of family game night. It always made me feel special and I always had so much fun! I guess psychologists have a million different reasons why family time is so important to the development of a child. I just know it was one of the highlights of being a kid, and it made me feel a whole lot closer to my mom and dad. Well, here’s something you dont see everyday, a multi player gameshow for the iPad, think Jeopardy, without the need to phrase the answers in the form of a question. Each player gets their own “Popper” in order to buzz in with an answer. The apps are available on iTunes and with several titles to choose from, family game night can be a blast! Fisher Price DVR – More TV for your Kids! It happened again yesterday, what could have been a pleasant dinner at our favorite restaurant ended up being a whine festival, and not the good kind of wine either. It just wasn’t my daughters day, and sitting still while grown-ups chatted and lingered over coffee wasn’t her idea of a good time. Now I certainly don’t advocate TV over good parenting, but sometimes you just gotta do what you gotta do, know what I mean? Fisher Price is hoping that you do, because on the off chance that your little darlings aren’t spending enough time glued to your television, they have developed a new gadget, aimed squarely at your poor little technology deprived kiddos. Meet the Kid Tough Portable DVR a “cool, kid-friendly handheld device.” Parents simply attach the Kid Tough portable DVR to its included base unit and then, to the TV and set top box, and you can easily record your kid’s favorite shows. 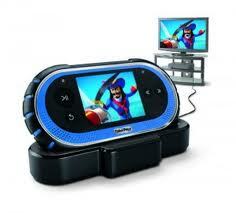 Read moreFisher Price DVR – More TV for your Kids!